Two of my favorite Christmas cookie recipes have been given to me by my dear mother-in-law, Adalou. 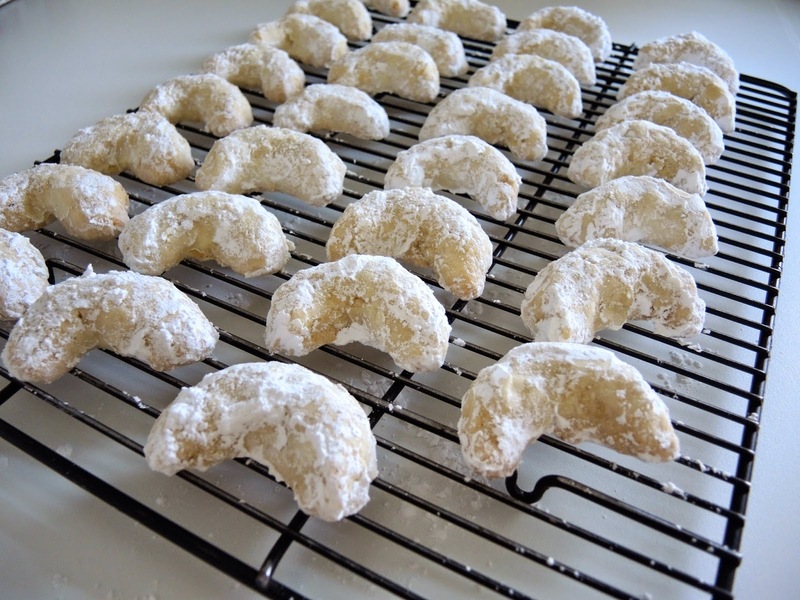 She has a vast repertoire of delicious recipes, but I just adore her Spritz Cookies and these tasty almond cookies. 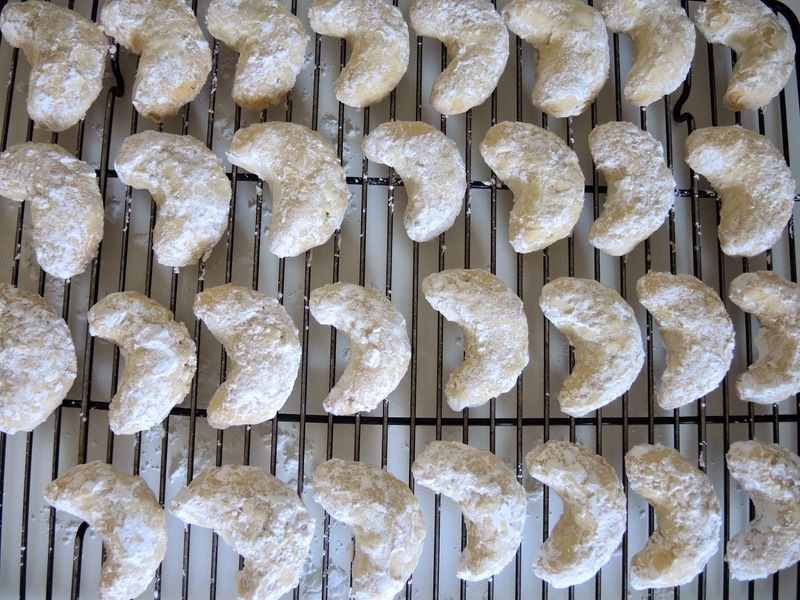 The almond cookie recipe came from her Aunt Cathie who called them Canadian Cookies, but I like to call them Crescent Moon Cookies because it conjures up a Norman Rockwell Christmas card image in my mind. Passing down recipes from one generation to the next is a tradition I hold dear and a way to stay connected with both the past and the present. Another tradition I adore is the holiday cookie tray. What is more festive than a large plate of assorted cookies to add to the Christmas table? 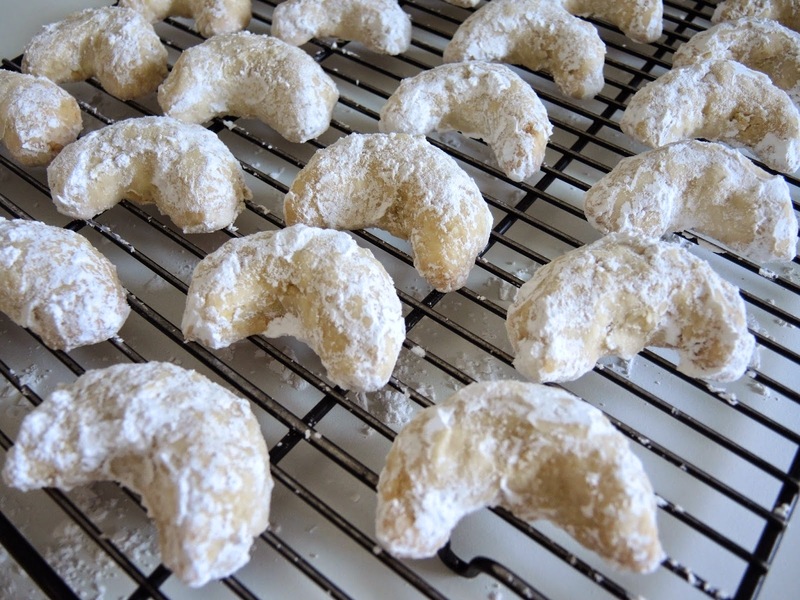 The Almond Crescent Moon Cookies and the Spritz Cookies are a good start. For a light and fun addition try the Meringue Mushrooms or the Meringue Drops, Or for a delicious traditional cut-out sugar cookie recipe try the Vanilla-Scented Sugar Cookies. Whether you include a few or all of these recipes your Christmas cookie tray is sure to be a hit and a great way to pass on a fun culinary tradition at the holidays. Wishing you all many Christmas Blessings! Use a food processor or blender to finely grind the almonds. The mixture can have some almond pieces, but the finer the grind the easier the dough will stay together. Preheat the oven the 325℉ (163℃). Line 3 baking sheets with silicone baking mats or parchment paper. 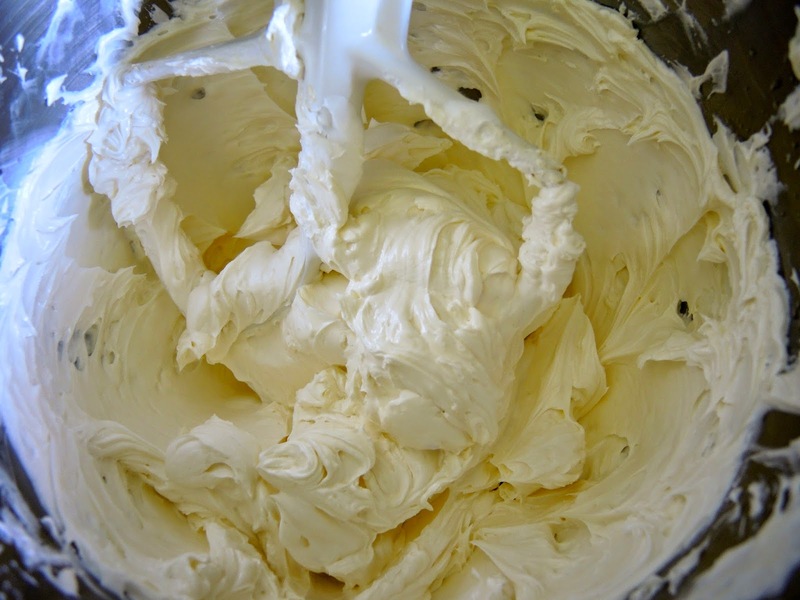 In the bowl of a standing mixer using the paddle attachment cream the butter and sugar on medium speed until light and fluffy. Sift together the flour and salt. On low speed add the flour/salt, almonds, almond extract, and ice water. Mix just until the dough comes together. 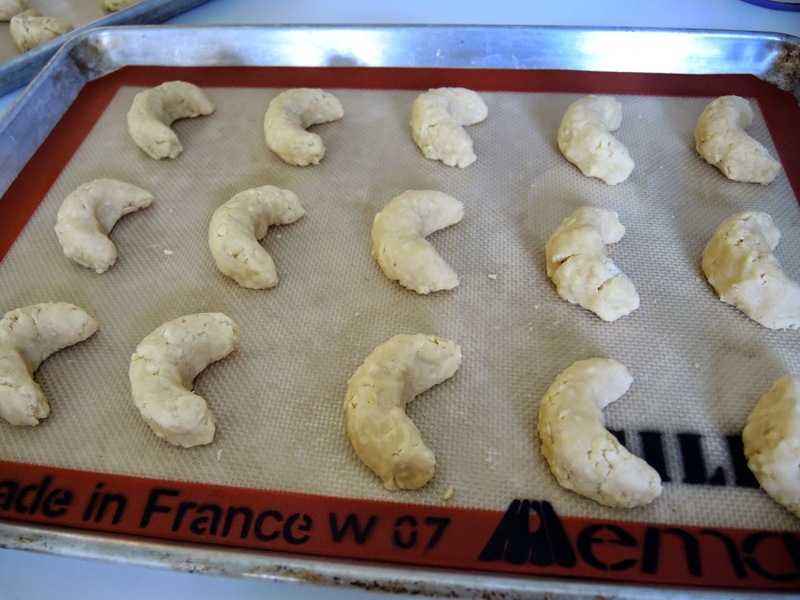 Roll spoonfuls of dough by hand then form into a crescent shape. Put on prepared baking sheets. Bake until cookies start to brown, 20-22 minutes. 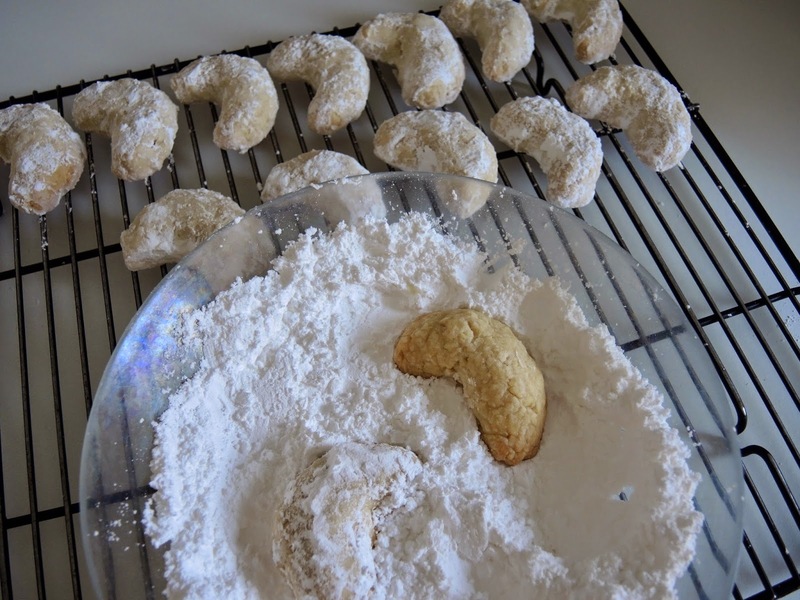 Remove from the oven and roll in confectioners sugar while warm. The cookies will keep at room temperature stored in an airtight container for several days. Layer the cookies between waxed paper or parchment paper sprinkled with additional confectioners sugar. 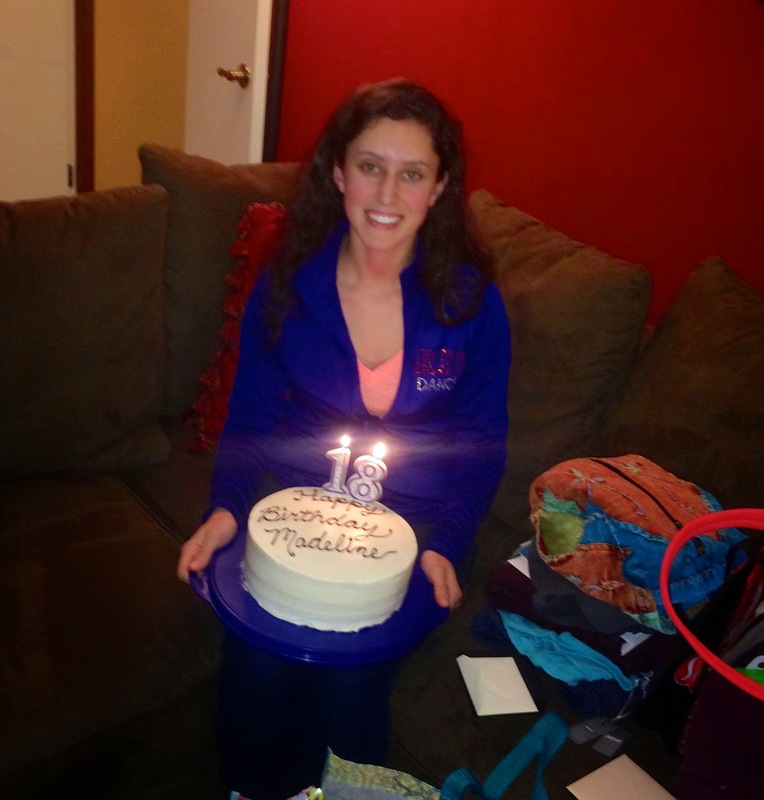 We have celebrated some milestone birthdays recently. My father turned 80 years old and now Maddie has turned 18. My father chose to celebrate with pie, but Maddie is a cake girl all the way. She loves cake. As a senior in high school she has much to celebrate. She will graduate in May and go off to college next autumn. While she does not know yet where she will land, the anticipation and excitement makes for an exhilarating and sometimes stressful year. Maddie is intelligent, beautiful, independent and talented. She is my child who has always said, "I can do it myself!" - and so she does. A dear friend remarked that this time of life is truly the definition of 'bittersweet' as your children make their way in the world you are so happy for them, yet it will forever change the landscape of your own life. 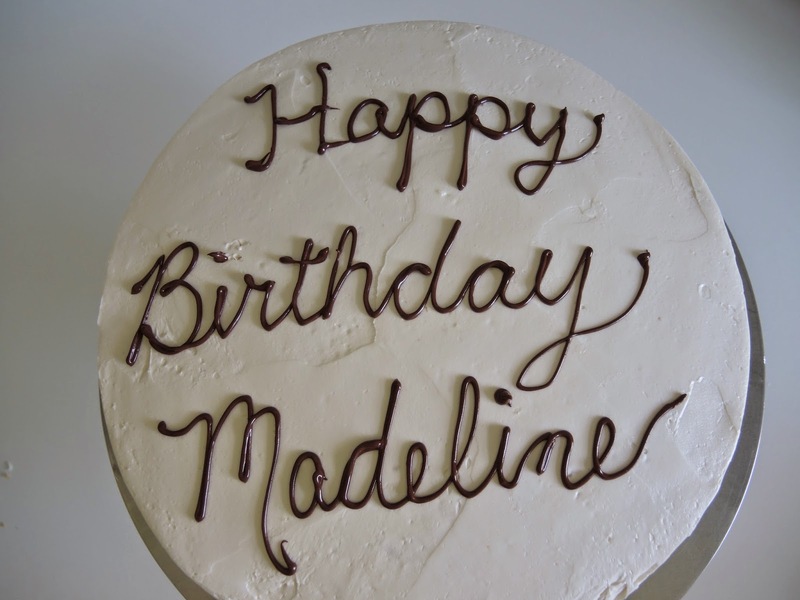 Go Maddie make your mark, but first let's celebrate with cake. This recipe is adapted from a recipe by the fabulous cookbook author Dorie Greenspan and makes a perfect white cake. The cake is delicately flavored with lemon zest and extract then brought together with a layer of raspberry jam followed by rich, lightly lemon-flavored buttercream. The combination is bright and festive - just perfect for a birthday celebration. But the great thing about this recipe is its versatility. For more of a lemon kick substitute lemon curd for the raspberry jam. Or for a pure vanilla cake replace the lemon zest and extract with pure vanilla extract. 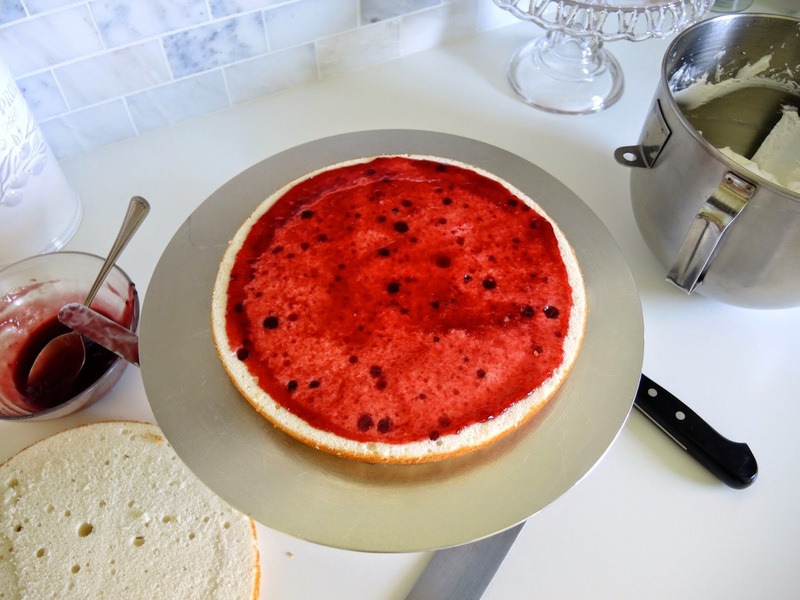 The basic recipe works with so many different interpretations that you will come back to this cake recipe over and over whenever you need a perfect, reliable cake fit for any celebration. Preheat the oven to 350℉ (175℃). 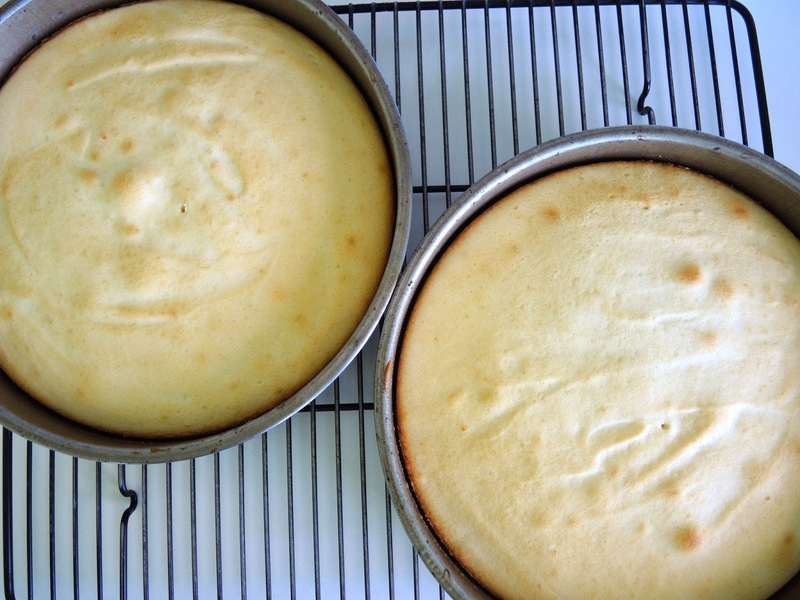 Butter and lightly flour 2, 9-inch (23 cm) round cake pans. 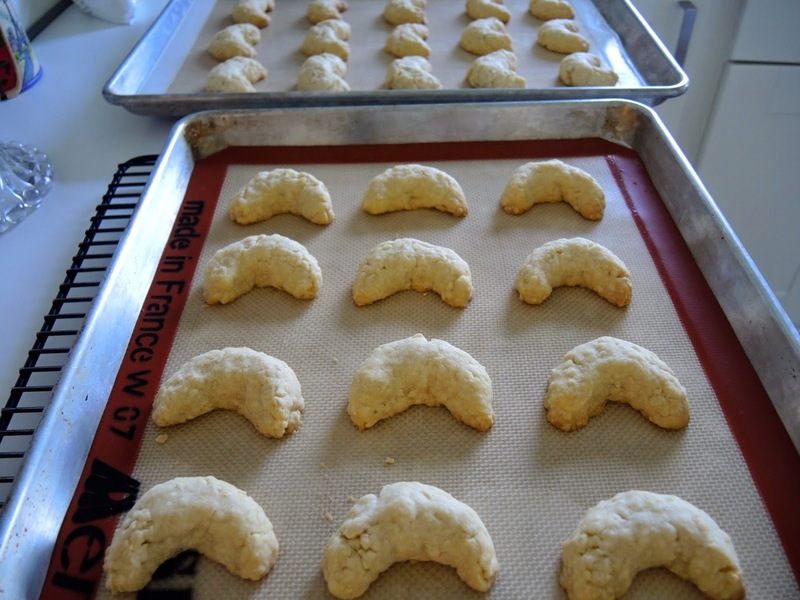 Line each bottom with a buttered round of parchment paper or waxed paper. 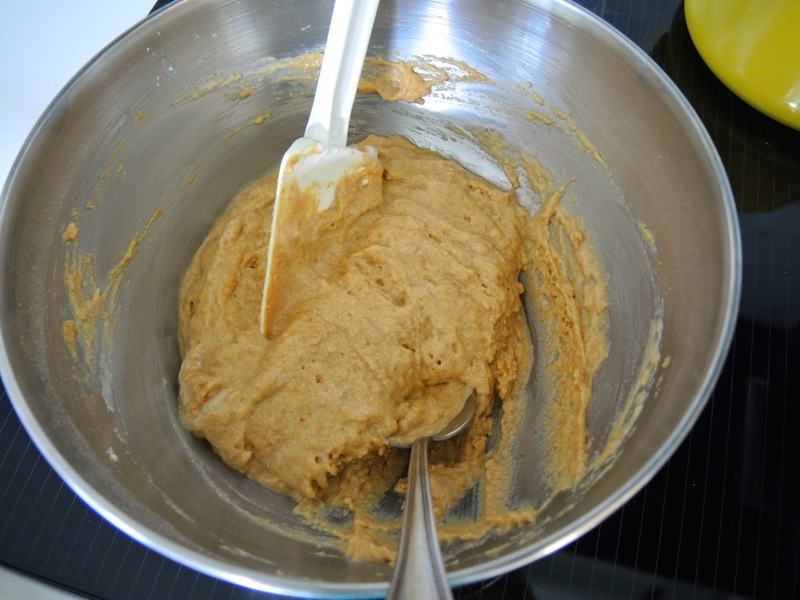 In a bowl whisk together the cake flour, baking powder, and salt. In another bowl whisk together the buttermilk (or whole milk) and the egg whites. In the bowl of a standing mixer rub the sugar and lemon zest between your fingers to release the oils in the zest. Add the butter and beat with a paddle attachment until very light and fluffy, about 3 minutes. Add the lemon extract. Alternate adding the flour and buttermilk mixture in three additions beating on medium speed and scraping down the sides of the bowl a few times. Once completely incorporated beat on medium speed for 2 minutes. 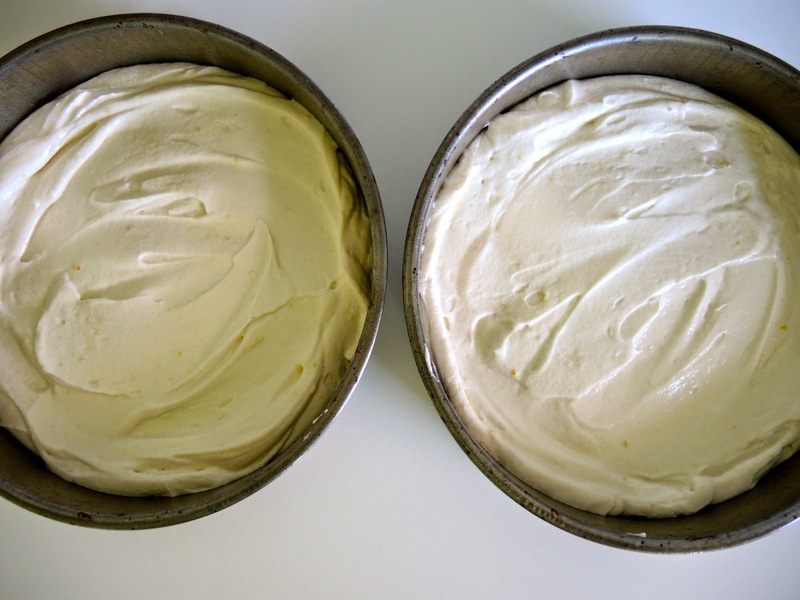 Divide the batter between the prepared cake pans and smooth the tops. Bake on the center rack until a cake tester comes out clean about 25-35 minutes. Cool on a rack for 5-10 minutes. Invert the cakes and allow to cool completely on the rack. Leave the parchment paper or waxed paper on until the cakes are completely cooled. Loosely cover the cakes with a thin, clean kitchen towel to keep them from drying out as they cool. (Once cooled remove the parchment paper or waxed paper before filling and frosting the cakes.) If not using immediately wrap air-tight and store at room temperature up to a day or freeze for up to a month. 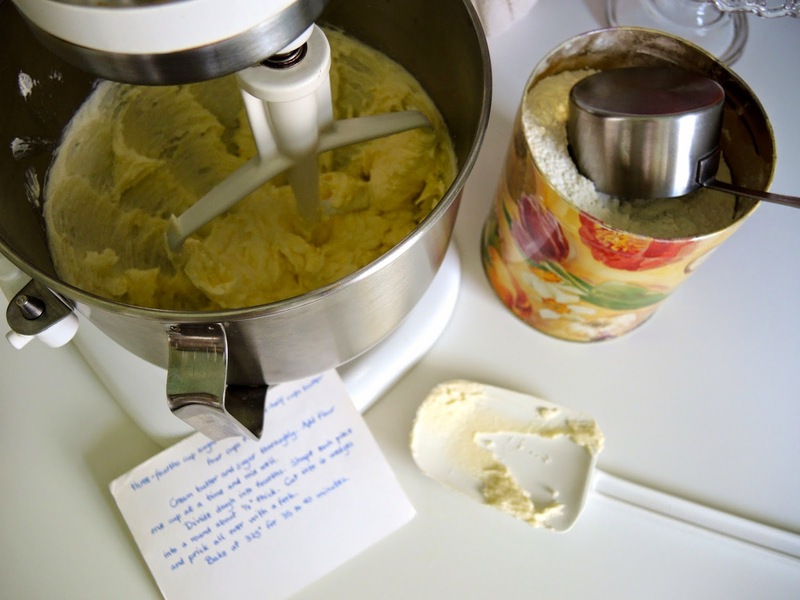 I love this buttercream recipe because it is nearly foolproof. You don't need a candy thermometer, you just heat the egg whites and sugar together to dissolve the sugar then beat until stiff and glossy before adding the butter. It makes a perfectly luscious buttercream every time. Whisk egg whites and sugar in a mixing bowl over a pan of simmering water (don't let the bowl touch the water) until the sugar has dissolved and the mixture is thick and very warm, about 3 minutes. Move the bowl to an electric mixer with a whisk attachment and beat on medium speed until mixture has cooled and the egg whites have formed stiff, glossy peaks. (If the mixture isn't cool it will melt the butter and cause it to separate. Just keep beating until the egg whites are cool about 5 minutes, but longer if needed.) Switch to a paddle attachment and add the butter a few pieces at a time until well incorporated. 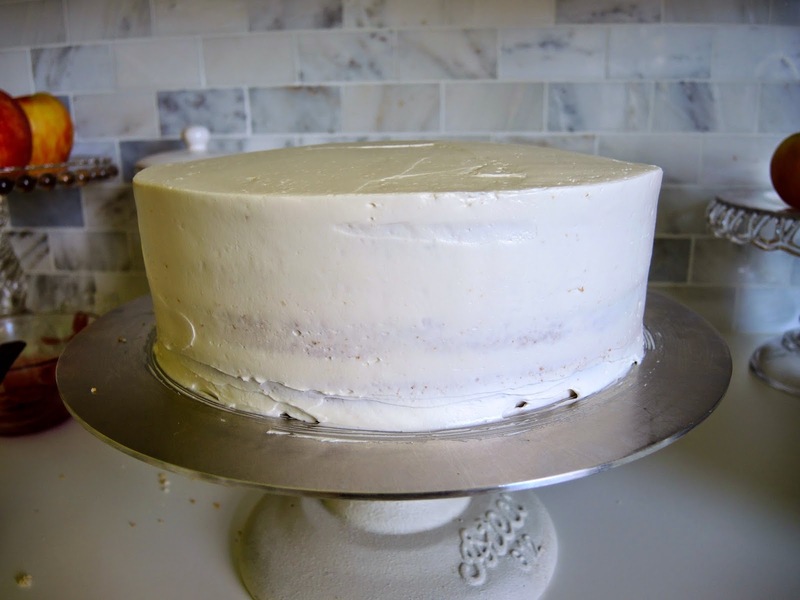 Beat the buttercream on medium-high speed for 6-10 minutes until very smooth and thick. If the buttercream starts to separate continue beating until it comes back together. Reduce the speed slightly and add the lemon juice slowly until incorporated, then add the vanilla extract. If not using immediately press plastic wrap onto the surface and set aside. Buttercream can be stored in the refrigerator for several days, but needs to be brought back to room temperature before using. Buttercream is always best served at room temperature. Stir the raspberry jam vigorously or warm slightly to make it spread easily. Cut each cake in half horizontally with a large serrated knife. Invert one layer on a cardboard cake round or cake plate. 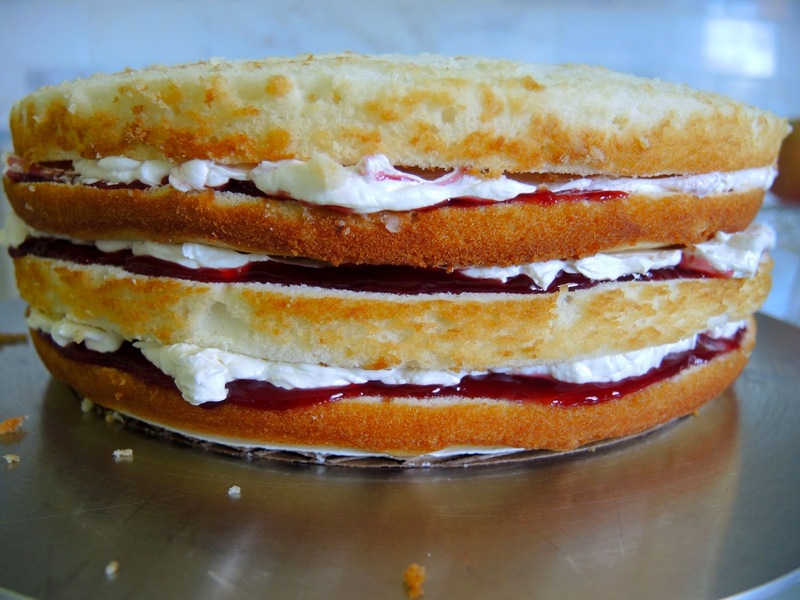 Spread with about a 1/4 cup (65 g) of raspberry jam then cover with a thin layer of buttercream. Do the same for two more layers then top with the final layer, cut side down. Frost the top and sides of the cake with the remaining buttercream. The cake is ready to serve. If not serving immediately cover and allow to sit at room temperature for up to 6 hours. Refrigerate for longer storage, but allow to come to room temperature before serving. 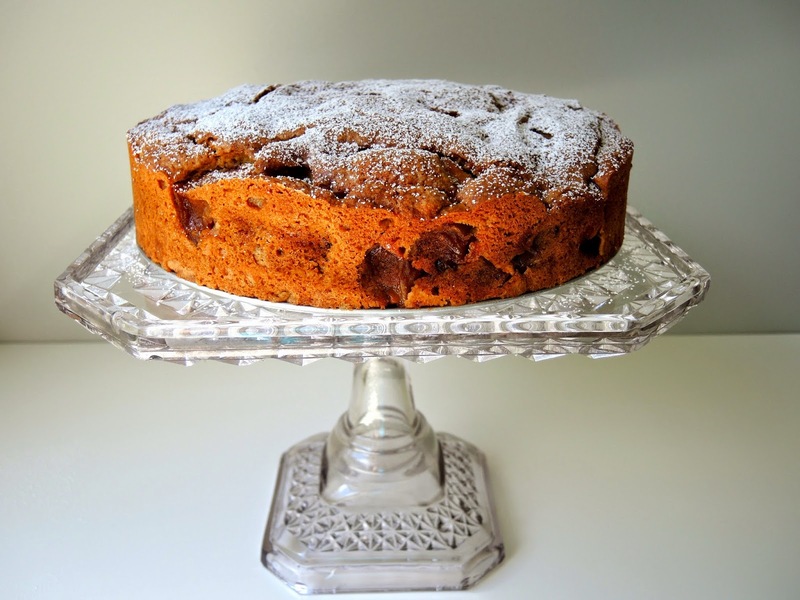 The cake is best served the day it is made, but will keep, refrigerated and well covered, for up to two days. It is no secret I love to roast vegetables (and fruits) in the oven. It creates such a deep, rich flavor and is so easy to do. But when I roast Brussels sprouts it puts Maddie over the edge. She just can't stand the way it makes the house smell. So I had to find a new way to cook these baby cabbages because I love them. 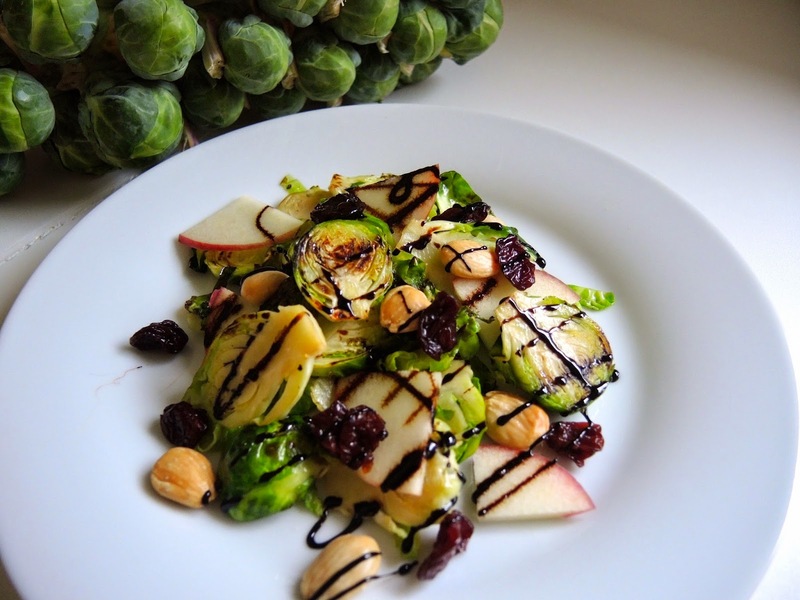 Recently, I had lunch with a dear friend and we shared a fabulous Brussels sprouts salad. The Brussels sprouts had been quickly sautéed. Bingo! That was my answer to having your Brussels sprouts and eating them too, without offending anyone. 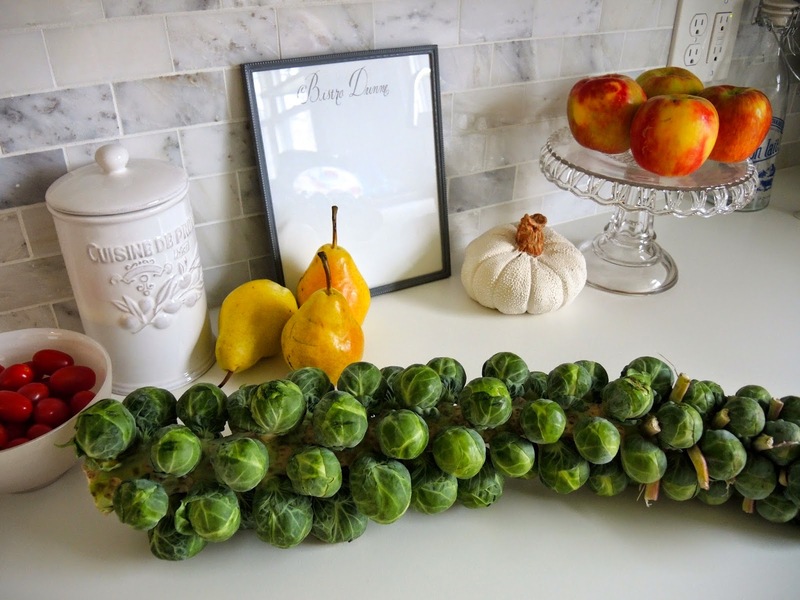 I think Brussels sprouts are a dreaded vegetable for a lot of people because they are often overcooked. This recipe just barely cooks them leaving a little bite that keeps them fresh and vibrant. Toss in some crunchy almonds, sweet dried cherries, tart apple and finish with a balsamic drizzle and the flavors explode in your mouth. The balsamic reduction really brings together the flavors. I first used it in the Roasted Tomato and Onion Soup with Balsamic Drizzle recipe. This time I left out the basil, but that version would work as well. Whether you consider this a salad or a side dish I think it would be a lovely addition to the Thanksgiving table. You will be surprised how people who hate Brussels sprouts won't be able to resist this flavorful dish. Thinly slice the Brussels sprouts about a 1/4 inch (.635 cm) with a sharp knife. You can use a mandolin slicer, but I think it is easier to cut by hand. 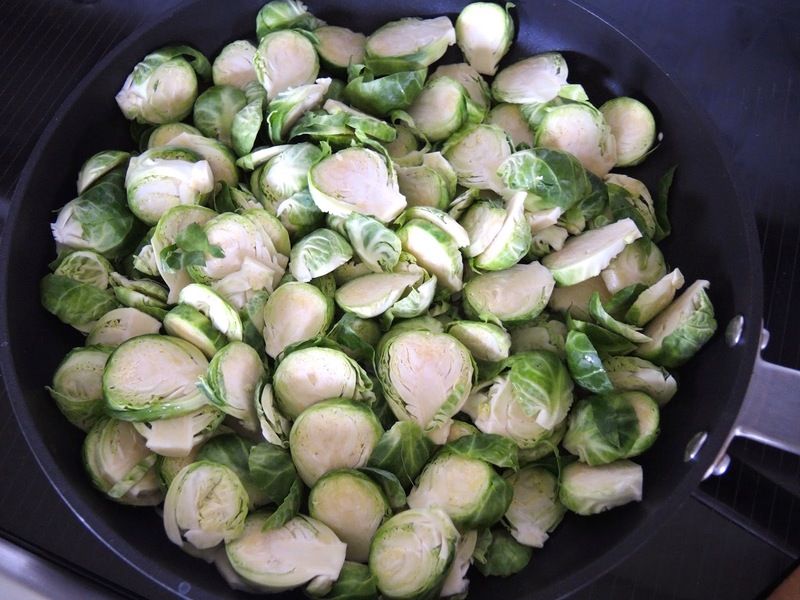 Cutting the Brussels sprouts allows them to cook really quickly. 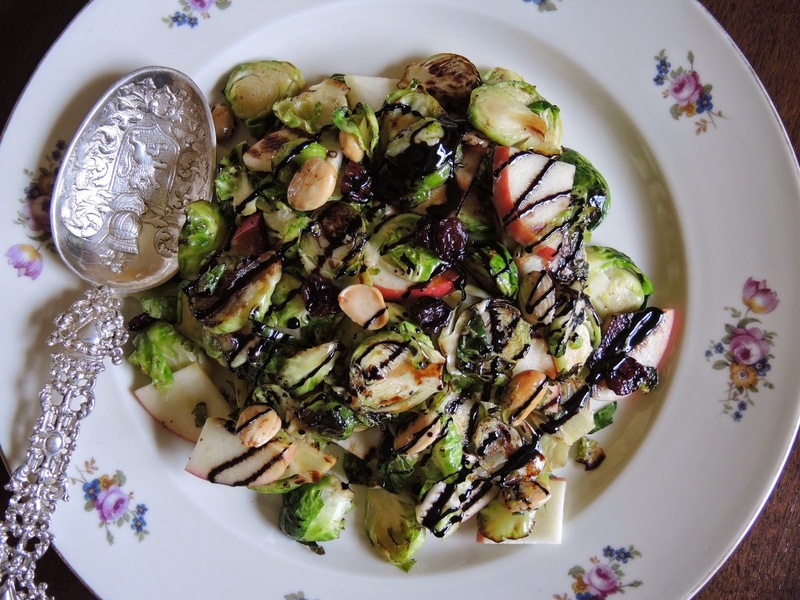 I did not include proportions for this salad except for the Balsamic Drizzle because it depends upon how many Brussels sprouts you want to cook. Just use your eye to judge. An apple will be enough and a generous handful of dried cherries and almonds, too. 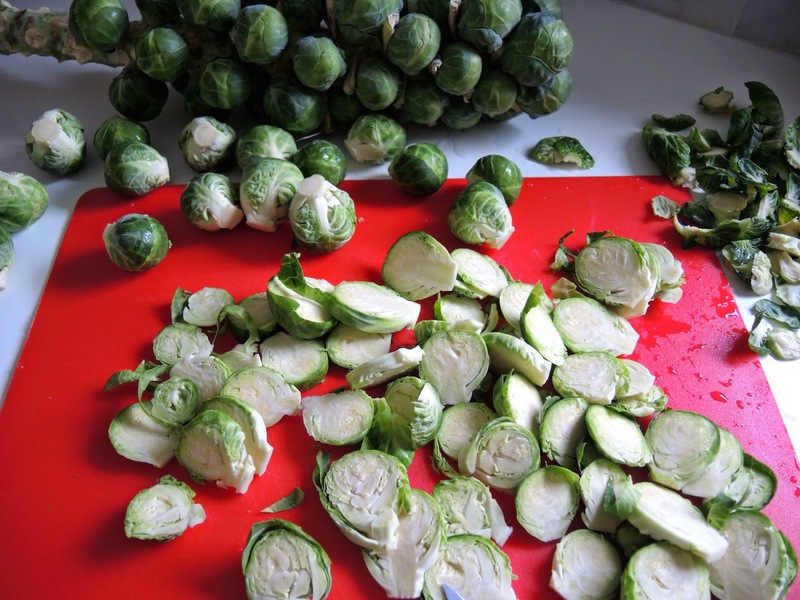 Wash the Brussels sprouts and slice about a 1/4 inch (.635 cm) thick. Put some olive oil in a skillet and sauté over medium-high heat for 5-8 minutes to brown the outsides and just barely cook the Brussels sprouts. Remove from the heat toss in apples, dried cherries, and almonds. Season with salt and pepper. Add more olive oil if needed to coat the ingredients. Put on a serving dish and drizzle with balsamic drizzle. Serve. The salad doesn't need to be hot it is fine warm or at room temperature. When I worked at the bakery we did not make donuts. In fact, when asked we would respond we don't do donuts with a bit of an air. At the time it wasn't an acceptable member of the pastry family. This was back before chefs were considered celebrities. Thankfully, once they achieved such star status a few clever chefs added the lowly donut to their repertoire and donuts began springing up (pun intended) all over the place. 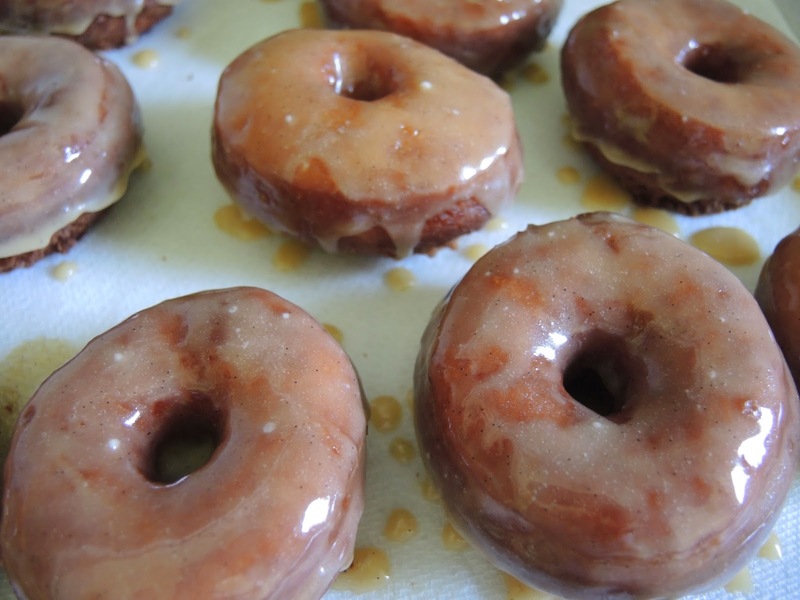 While superstar chefs may have turned the pedestrian donut into chic pastry, it is our mothers and grandmothers who knew all along that nothing says loving like a homemade donut warm from the fryer, still dripping with glaze. It is the ultimate comfort food. These cake donuts get an autumn twist with apple cider and some warm spices. Although there isn't any yeast the dough does need to rest for an hour or two. Or the dough can be made the night before and left to rest in the refrigerator overnight then fry the donuts hot and fresh for breakfast. 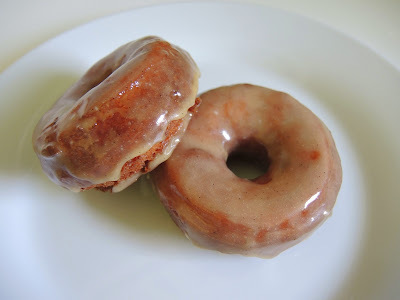 The glaze can be made ahead, too and refrigerated. Warm slightly to bring back to the correct glaze consistency. 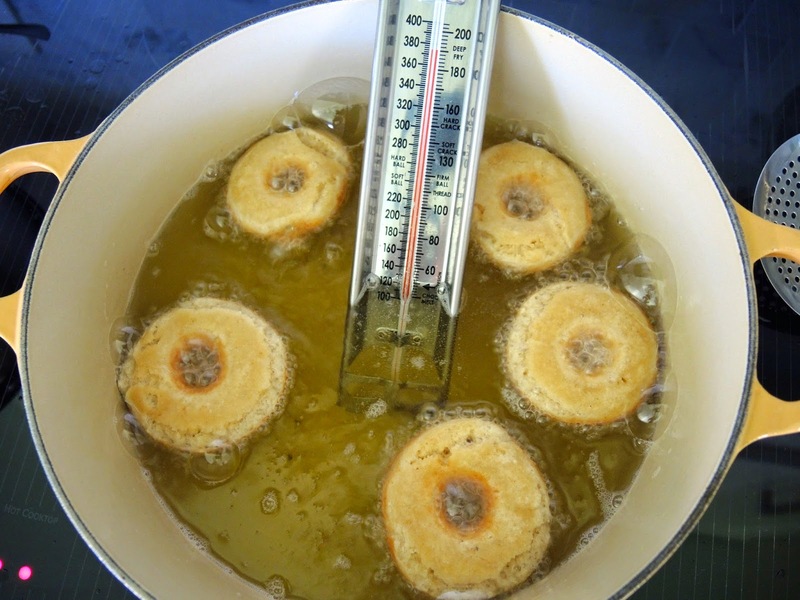 The only trick to making donuts (or any fried food) is the keep the oil at the correct temperature so keep a thermometer in the oil and keep an eye on it. If the oil is too hot you will burn the outside before the inside is cooked. 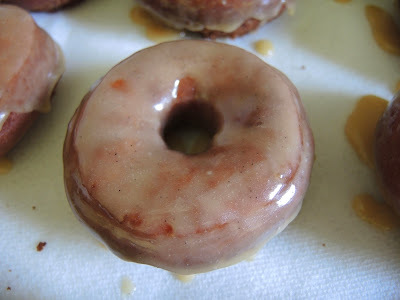 If the oil is too cold the dough will absorb the oil and the donut will be greasy. As with all donuts they are best eaten the day they are made, but that shouldn't be a problem, as these tend to disappear quickly. 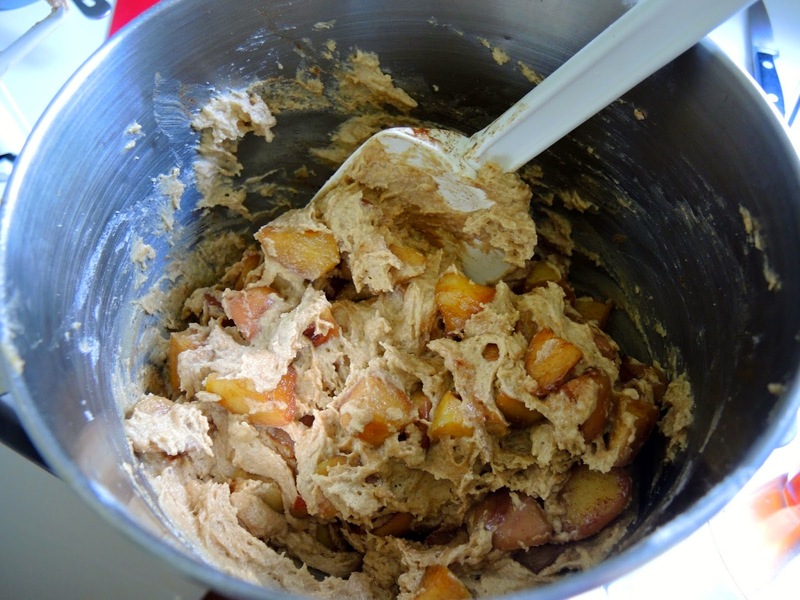 In a bowl whisk together the flour, baking powder, salt, cinnamon, nutmeg, and cloves. Set aside. In the bowl of a standing mixer beat eggs and sugar until light yellow and thick. Add vanilla beat to incorporate. Alternate adding the flour mixture, apple cider, and butter in two additions. Mix just until incorporated after each addition. Cover the dough and chill for 1-2 hours or overnight. Roll out the dough to about a 1/2 inch (1.27 cm) thick on a lightly floured surface. 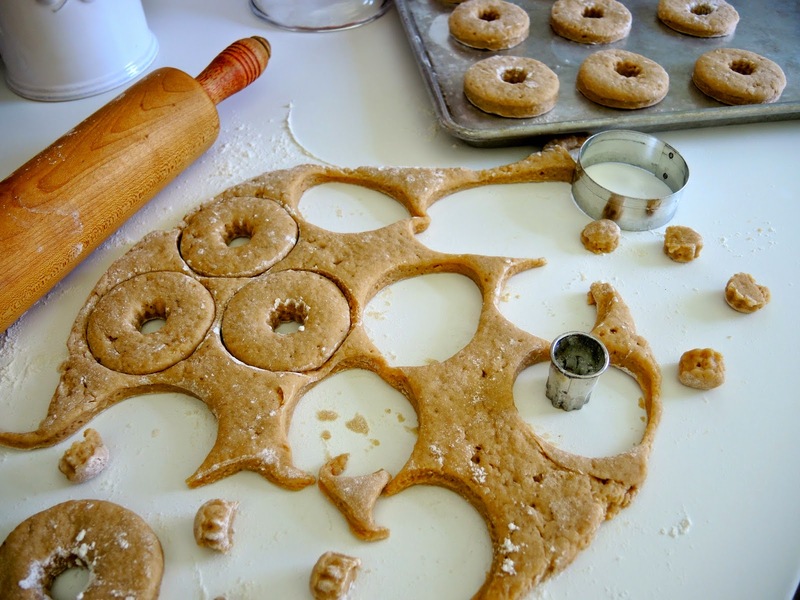 Cut into donuts with a 2 1/2 inch (6.35 cm) round cookie cutter and a 1 inch (2.54 cm) cookie cutter for the center. Heat oil to deep fry on a thermometer 375℉ (190℃). Fry donuts a few at a time until golden about 1 minute per side, turning once with a slotted spoon. Drain on paper towels. Cool. Dip in Vanilla Bean Cider Glaze. Split the vanilla bean down the middle and scrap out the seeds. Put the seeds and the vanilla bean pod in a skillet with the apple cider. Cook over medium high heat until reduced to about 1 1/2 cups (375 ml). Add brown sugar and butter. Cook until thickened. Remove from heat and allow to cool slightly. 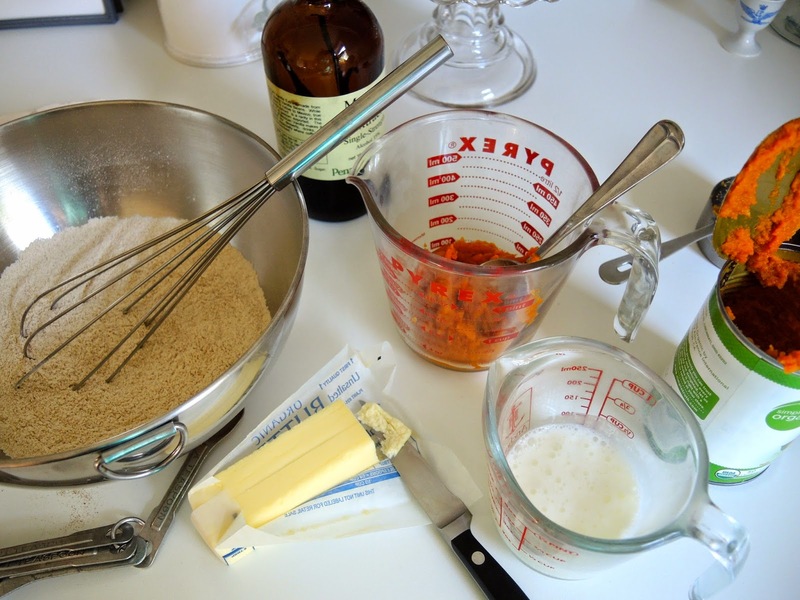 Whisk in confectioners sugar until smooth and the consistency of glaze. It may take more confectioners sugar. 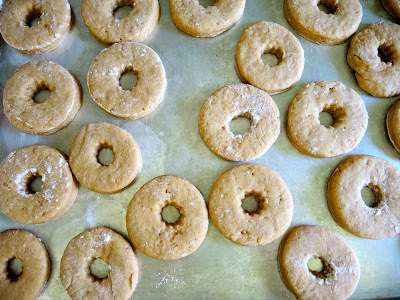 Use to glaze the Apple Cider Donuts. There are times in our lives that are magical, but we often do not recognize them until they are gone. I am not talking about big life events, but the small daily moments that become so dear in reflection. 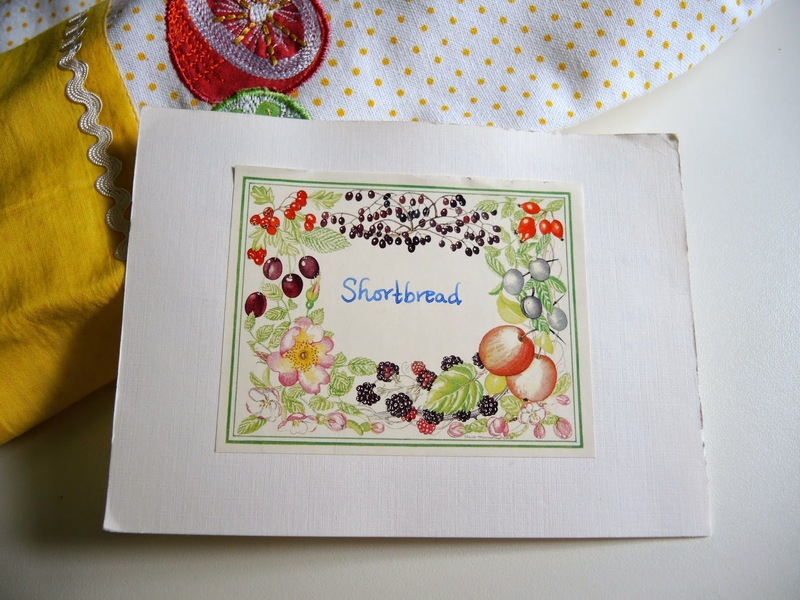 When I peruse my recipe file full of recipes penned by dear friends and family, some of whom are no longer with me, happy memories flood my mind. I met Kelly many years ago at a party at my neighbor's home. Truth be told I did not want to go to the party because other than my husband and my neighbors I did not know any of the people. It turns out Kelly felt the same way. Her husband knew our neighbors, but she was in the same boat. So after being good guests for a reasonable amount of time the four of us were edging our way toward the front door when we struck up a conversation. Lucky for me that chance meeting turned into a long, beautiful friendship that has greatly enriched my life. It just goes to show the importance of getting into the things we can not get out of, which was my husband's motto. I have learned so much from Kelly who is talented in countless ways. I have enjoyed many happy times with her, but my favorite is the delightful ritual of afternoon tea that Kelly introduced to me so long ago. 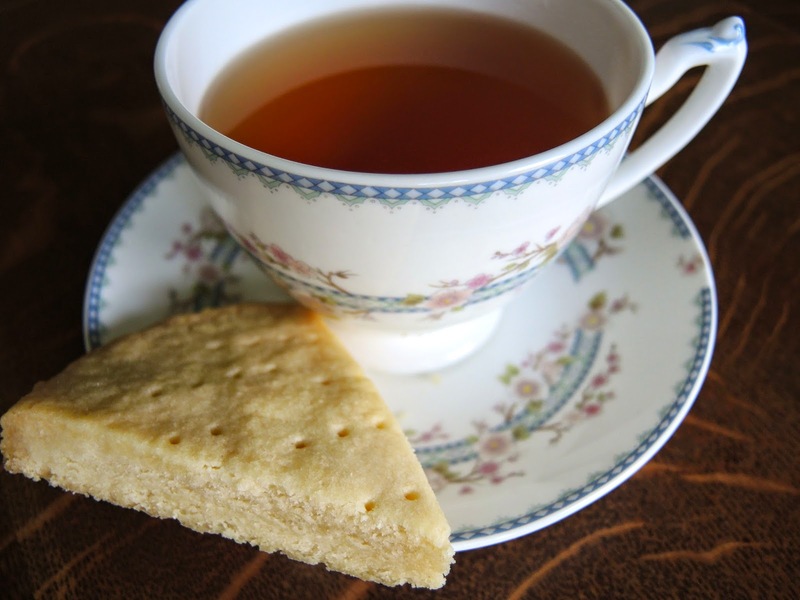 This delicious shortbread is her recipe and the first treat she ever made for me. 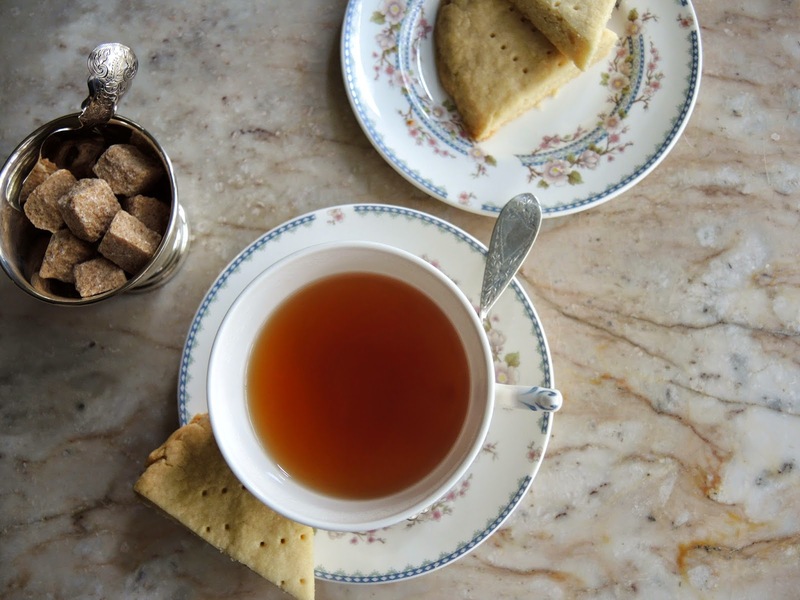 We sat in her beautiful garden sipping tea, nibbling shortbread and getting to know one another. It began a friendship that will last a lifetime. Unfortunately, we no longer live in the same city and thus cannot enjoy those simple daily pleasures together, but I only have to open my recipe file and close my eyes to remember all those happy times we shared. Preheat oven to 325℉ (160℃). Line two baking sheets with silicone baking mats or parchment paper. 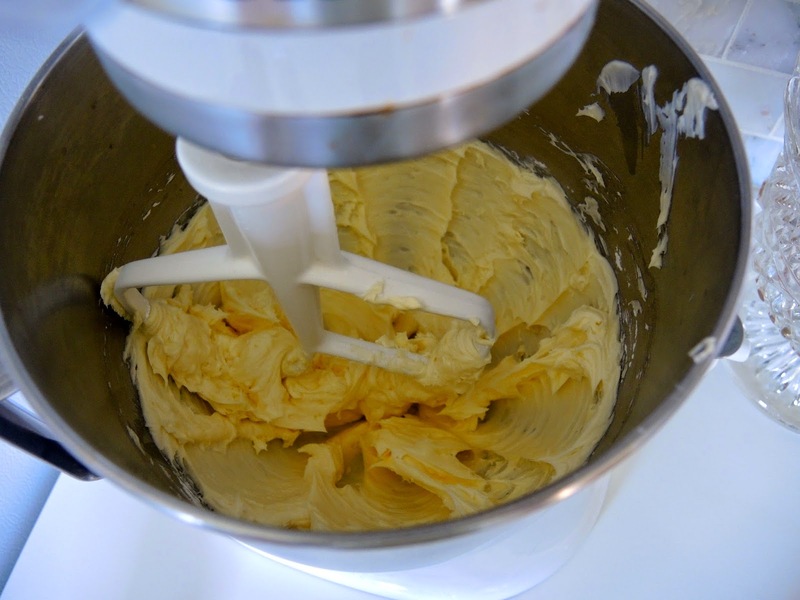 Cream butter and sugar thoroughly in the bowl of a standing mixer with a paddle attachment. Add flour one cup at a time and mix well. Divide dough into fourths. Shape each piece into a round about a 1/2-inch (1.25 cm) thick. 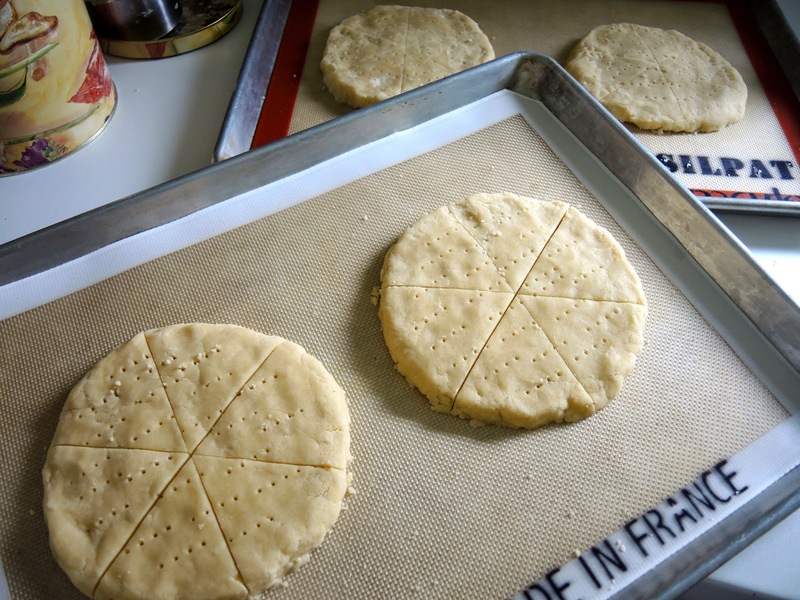 Put two rounds on each baking sheet. Cut each round into 6 wedges, but leave together and prick all over with a fork. Bake for 30-35 minutes until firm in the middle and the edges are lightly browned. Rotate the trays once or twice for even baking. 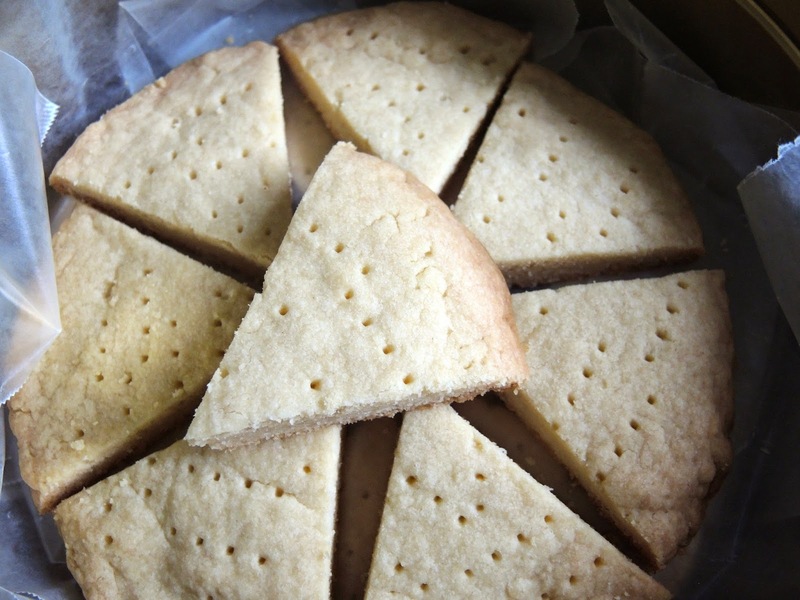 After removing the shortbread from the oven carefully cut through the wedges again. Cool on the trays for 5 minutes then move to a rack to cool completely. The shortbread will keep for several days in an airtight tin. My father turned 80 years old. He is a pie guy. Like me, he has rarely met a sweet he won't eat, but when asked what he wants for his birthday dessert nine times out of ten he will choose pie. Of course cake is the usual birthday fair, but it is always nice to mix it up a little. He isn't picky. He likes all kinds of pie, but Cherry and Apple are among his favorites along with Coconut Cream, Pecan, Raisin, Lemon Meringue, and Peach, the list goes on and on. My father has been blessed with a long, happy, healthy life and in the process he has blessed us in more ways than are imaginable. He has a loving wife (our mother) of 57 years, two adoring daughters (myself included) and four thankful grandchildren who affectionately refer to him as 'the chief' because is the head of our clan. His deep Christian faith, quiet strength, and abundant and unconditional love is the backbone of our family. 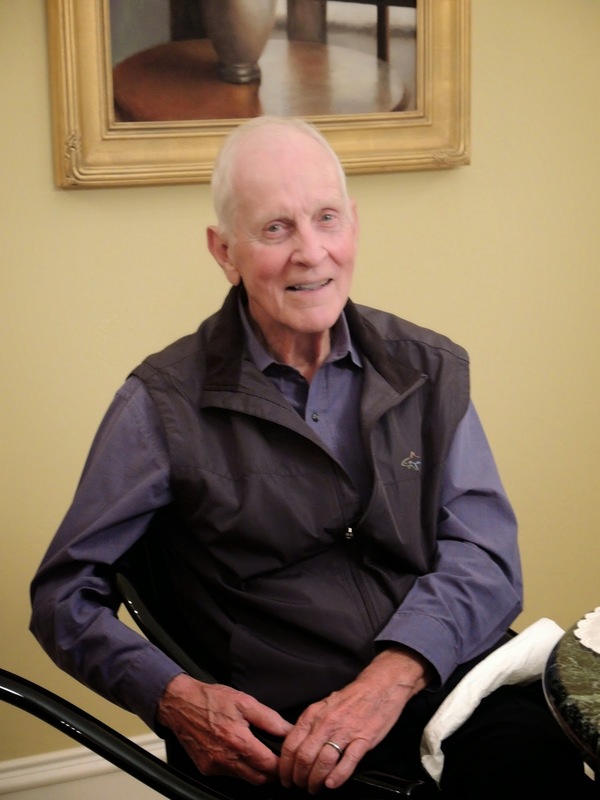 He has taught us so many things from basic car or home maintenance and financial responsibility to the power of perseverance and the benefit of kindness. He has sat through countless hours of sporting events and dance competitions and recitals all without complaint, always lending his gentle support. He listens way more than he speaks which is not a common trait in our family. But when he speaks it is usually important. He is the calmest and most patient person I have ever known. If we were all more like my father our world would be a much better place. My father gives way more than he receives, so it is a small thing to make him pie for his birthday. It is a task I welcome and enjoy. 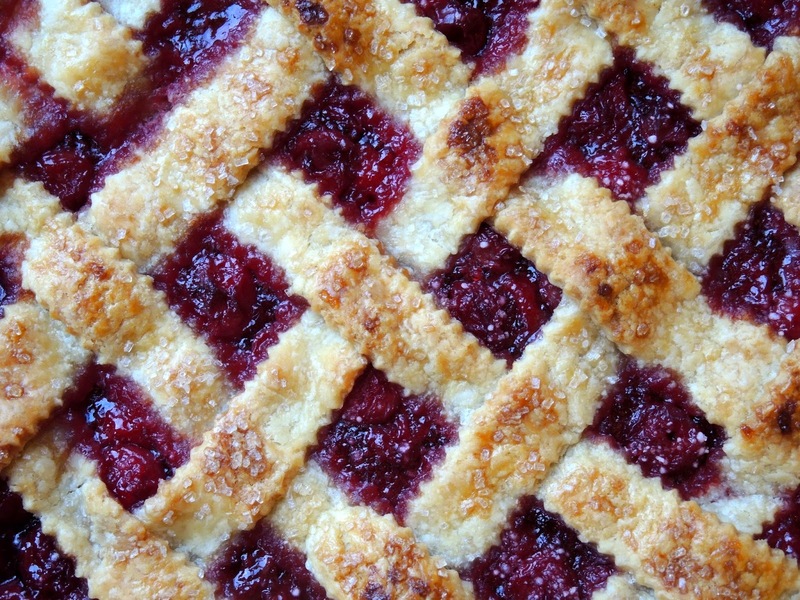 But instead of re-creating the wheel I made a Cherry Pie I have made for him on several occasions. It is from a previous post and based on a recipe from my mother's recipe file. 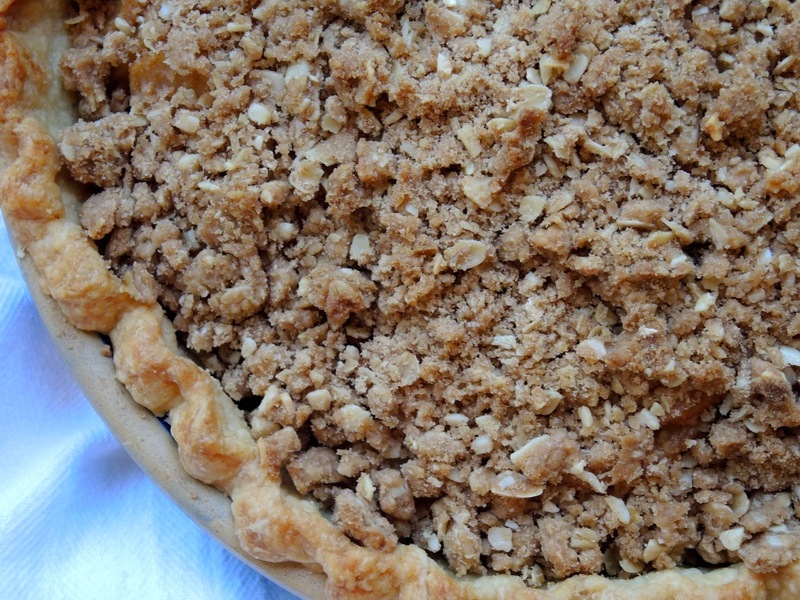 When one pie is good, two are better, especially when feeding a crowd, so I made this Roasted Apple Pie also from a previous post, because it is autumn and I love all things roasted during this time of year. Happy Birthday Dad! May you be blessed as abundantly as you have blessed us. My parents enjoying their golden years! Many years ago I was at a dinner party in San Francisco on a chilly autumn night. Not only was the host a gifted graphic designer he was also a fabulous cook. At the end of the meal he whipped up a very quick dessert of caramelized bananas with ginger served over vanilla ice cream. It was the first time I had experienced fresh ginger, and I can still remember the explosion of flavor. Now I eat ginger fresh and dried all year long, but it is particularly appealing during the fall especially when paired with ripe autumn fruit like Bosc pears. 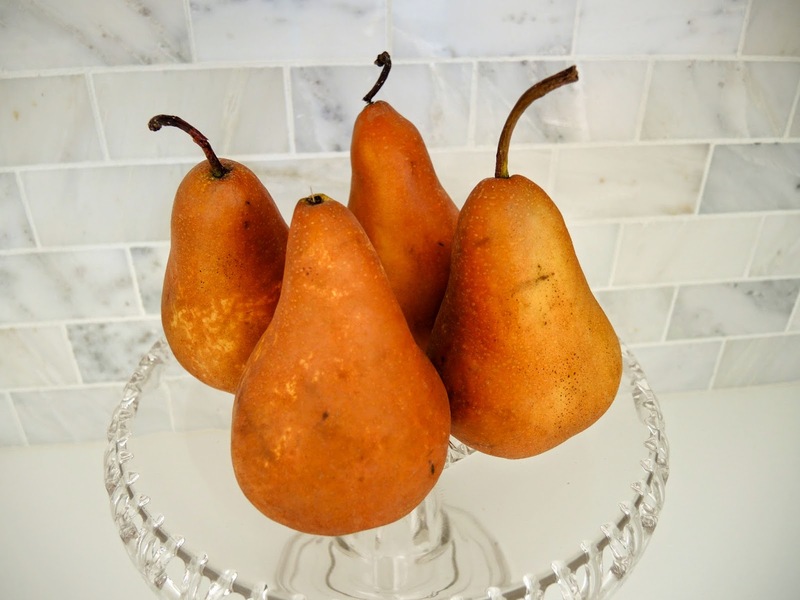 I love the texture, flavor, and sweetness of Bosc pears. They hold up so nicely when baked and they have a depth of flavor that lends nicely to warm autumn spices. 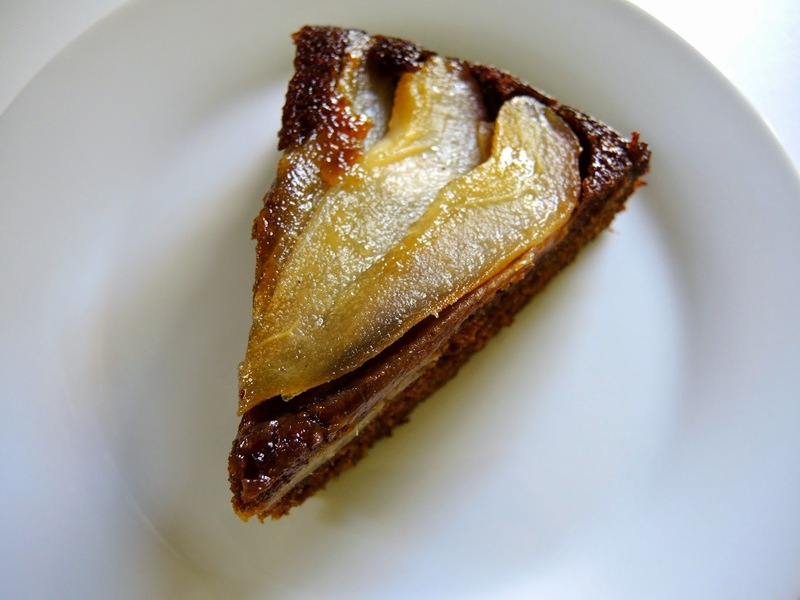 A play on the classic upside-down cake this rustic version combines two of my favorite autumn flavors: pears and fresh ginger. But nice crisps apples would be a delicious substitute if pears aren't your thing. Or if you don't have ripe pears on hand. While I baked the cake in an iron skillet, if you prefer a more refined look it can be baked in a regular cake pan or a spring-form pan. If using a spring-form pan wrap the outside with aluminum foil to catch any possible run-away juices from the pears. If you can not find Lyle's Golden Syrup either increase the molasses or the brown sugar by a 1/4 cup (60 ml or 60 g). 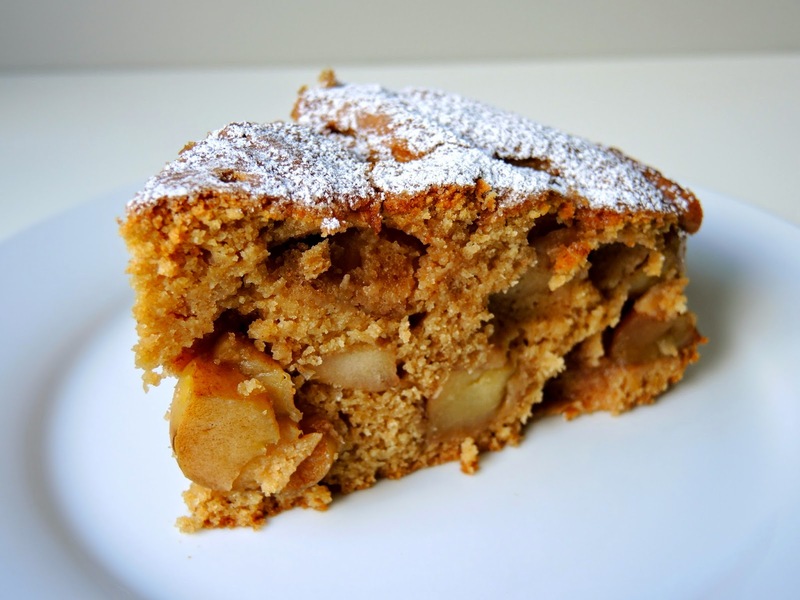 The cake is a snap to make and is tasty at any time of day. Peel, core, and cut each pear into quarters. Slice each quarter into 3-4 slices. 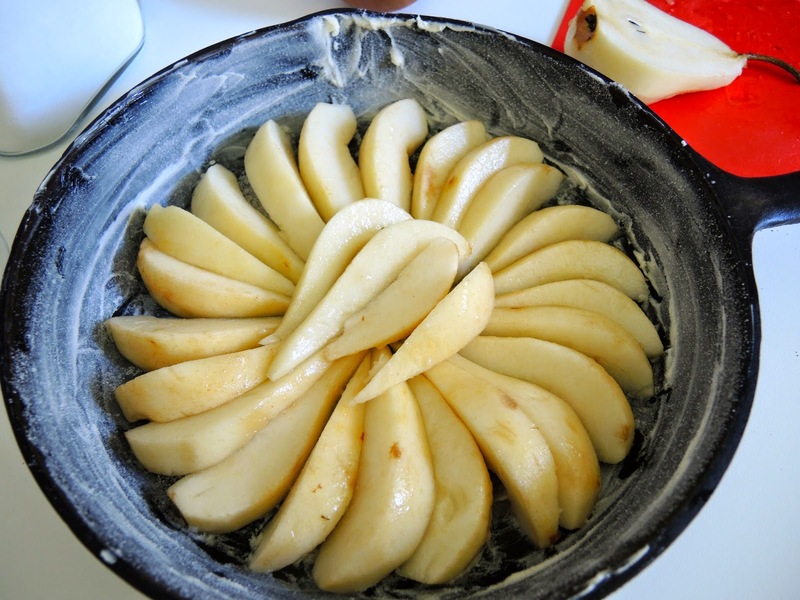 Line prepared skillet (or cake pan) with pear slices in a spiral pattern. In a bowl sift together the flour, baking soda, cinnamon, cloves, nutmeg, and salt. Set aside. In a large saucepan melt the butter with the fresh ginger stirring for a minute or two. Add the molasses, Lyle's Golden Syrup, and brown sugar. Stir to incorporate. Whisk in the flour mixture followed by the eggs, then the boiling water making sure all ingredients are combined. 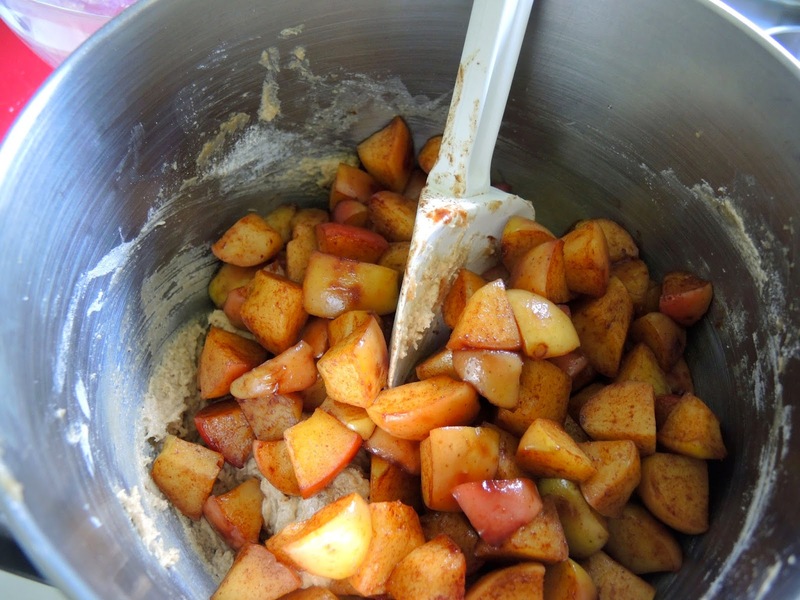 Pour the batter over the pears and bake in the middle of the oven for 35-40 minutes until a tester comes out clean. Cool on a rack for 10 minutes before inverting the cake onto a plate. Serve warm or at room temperature. (If using a cake pan or spring-form pan allow the cake to cool completely before removing from the pan.) The cake can be stored covered at room temperature for a day or two. Refrigerate for longer storage. I think pumpkin is a vegetable (technically it is a fruit) that people either love or hate. I happen to love it. When the leaves begin to change color and autumn is on the way I crave pumpkin in both sweet and savory forms. Perhaps subconsciously I desire it for its nutritional value, although I'm not sure how far that goes once you add sugar and butter. But everything in moderation, right? That is the key as my mother always says. As I mentioned in my Sautéed Apple Cake post I have been baking with white whole wheat flour a lot lately. So I used it in the Pumpkin Spice Pancakes, but regular all-purpose flour is fine. I think spices really enhance pumpkin's flavor, so I added cinnamon and a good pinch of ground nutmeg, cloves, and ginger. Feel free to use any warm spices you desire or omit them if you prefer. Folding in a whipped egg white lightens the batter and keeps the pancakes tall and fluffy. The recipe can easily be doubled. 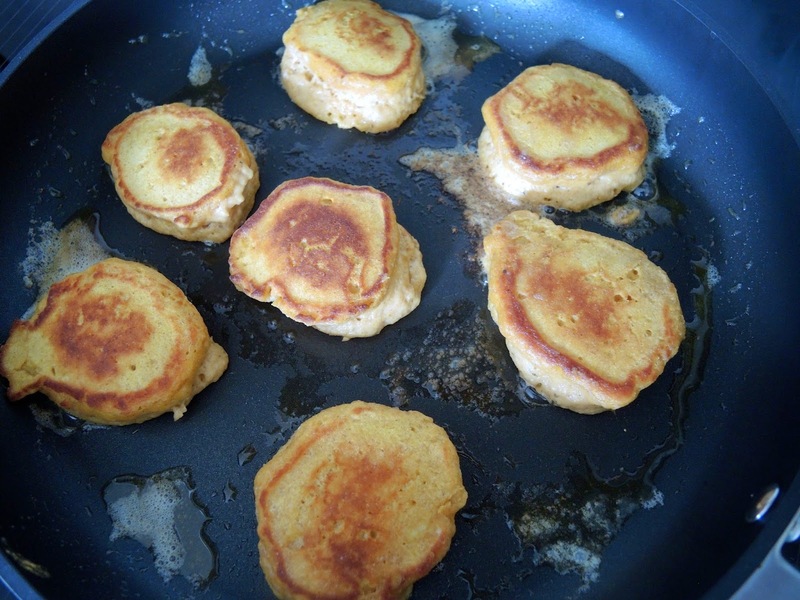 (Left-over pancakes can be gently warmed in the oven or microwave.) 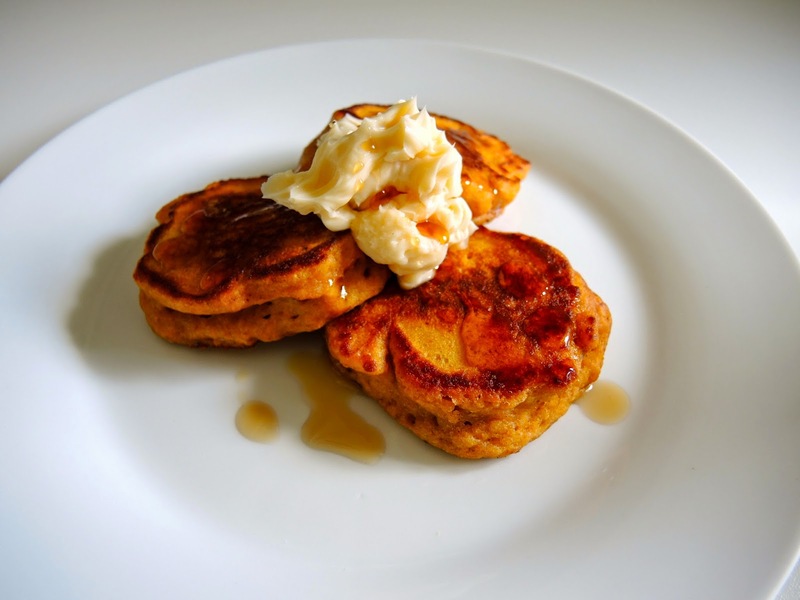 Serve the spicy pancakes with a generous dollop of maple butter, additional maple syrup, and Applewood-smoked bacon. What could be a better autumn breakfast? Note: all milk or all buttermilk can be substituted if you don't have one or the other. For the pancakes - In a bowl whisk the flour, baking powder, sugar, cinnamon, nutmeg, cloves, ginger, and salt to combine. In another bowl stir together the pumpkin purée, the egg, melted butter, buttermilk, milk, and vanilla. Pour into the flour mixture and stir gently just until combined. Beat the egg white with a whisk or hand mixer until it holds a soft peak. (If the pancake batter seems too stiff add a little more milk or buttermilk before adding the beaten egg white.) Carefully fold the egg white into the pancake mixture to lighten the batter. Be careful not to over-mix. Melt a generous amount of butter in a skillet over medium-low heat. Drop large spoonfuls of pancake batter into the hot pan and allow to brown before turning over. Cook on each side about 2-3 minutes until the pancakes are cooked through. Repeat with remaining batter adding more butter with each batch. Keep finished pancakes in a warm oven until ready to serve. 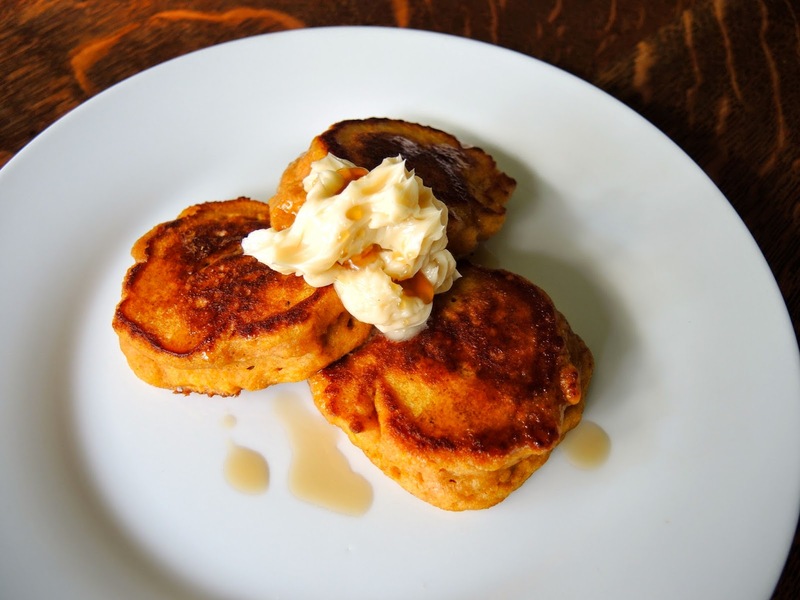 To serve - top pancakes with a dollop of maple butter. Serve with additional maple syrup. 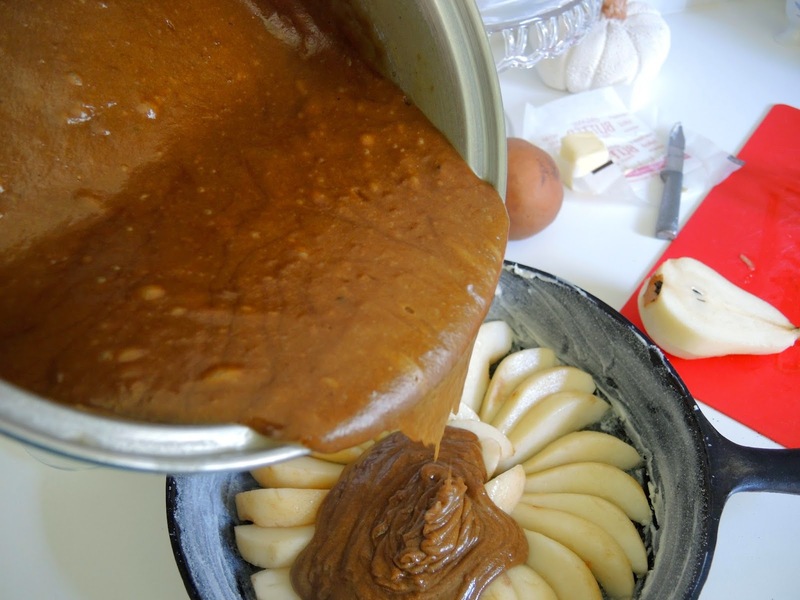 For the maple butter - Put the butter in a bowl and whip lightly with a fork or whisk. Add the maple syrup and continue to stir to incorporate. This cake should really be called procrastination cake because I created it when I was doing just that. I was supposed to be cutting the grass, a task I loathe, but I kept putting it off. Addison is my resident lawn maintenance engineer and with him back at school I am stuck with the job. I can whip up a cake or a batch of cookies with ease, but cutting the grass is out of my skill set. I'm truly terrible at it. I can't see where I have cut and I can't see where I need to cut. I either go over the same spot several times or miss whole chunks. As I survey my results I often find tufts of grass sticking up between my crooked rows. When my husband was alive we had a clear division of labor. I tended the garden and he took care of the grass. It created perfect harmony in our marriage. He actually enjoyed cutting the grass with the engineer in him making it a calculated and precise art. 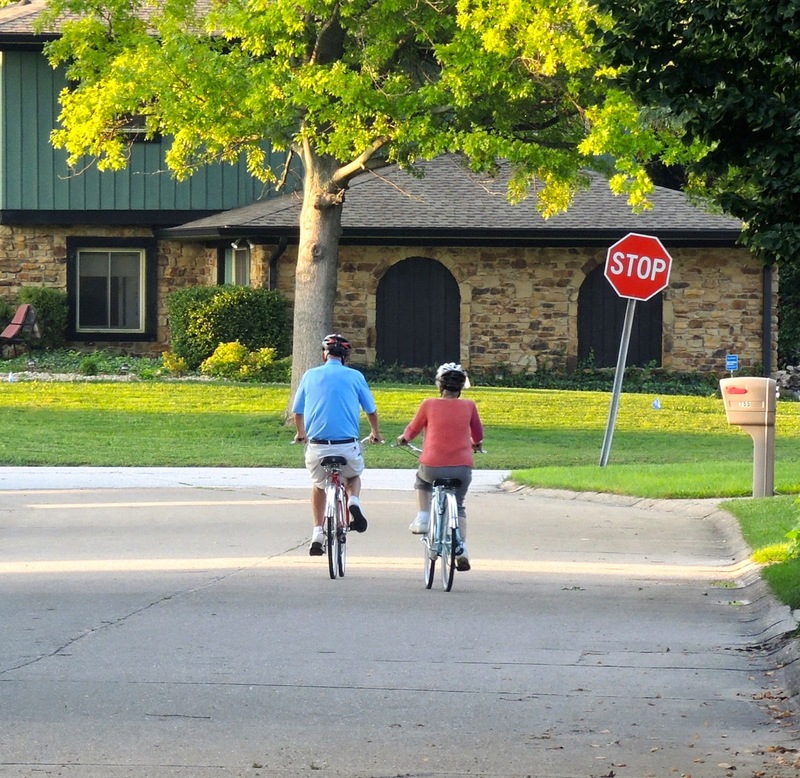 He would check to see which direction and pattern our neighbor had done and he would do the same. They both appreciated each other's devotion to a beautifully manicured lawn. 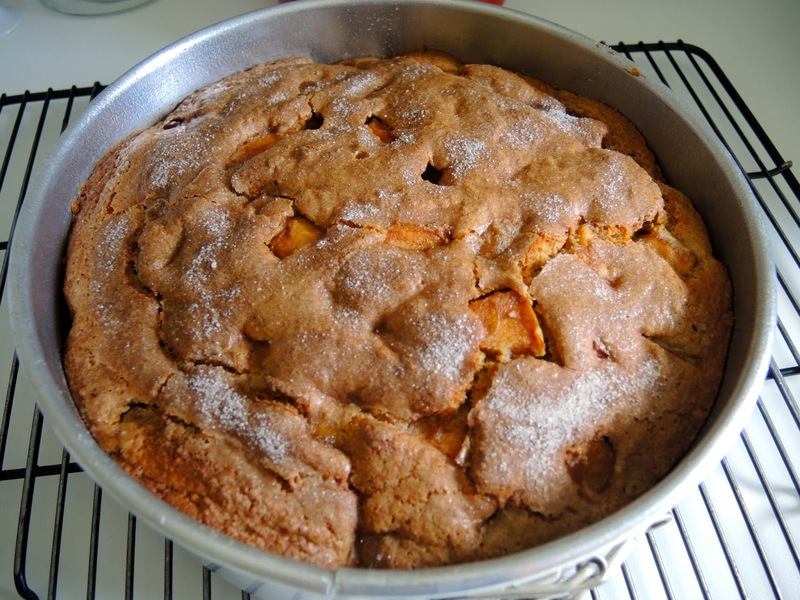 I realize my attempts would not live up to his standard and so I put off cutting the grass as long as possible thus Sautéed Apple Cake was born. While my skills on our lawn don't measure up, when the cake was in the oven Maddie said the house smelled so good she wished she could bottle the scent. High praise from my darling daughter. She was eager to sample the cake, but knew she would probably have to wait while I photographed it. "Yes!" was her response when I finally handed her a piece. Such is the patience required of those who live with a food blogger. 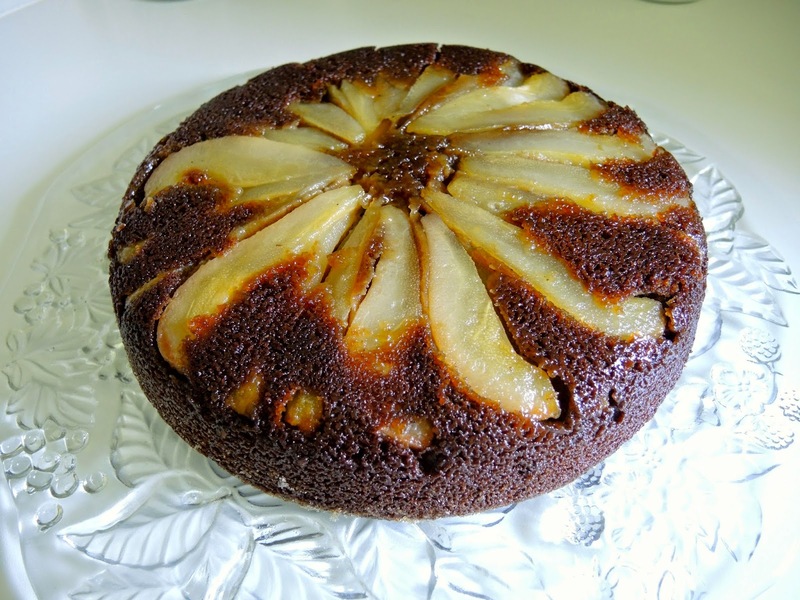 Because this is a rustic cake I did not peel the apples and I like the added flavor the peel provides. Feel free to remove the peel if you prefer. 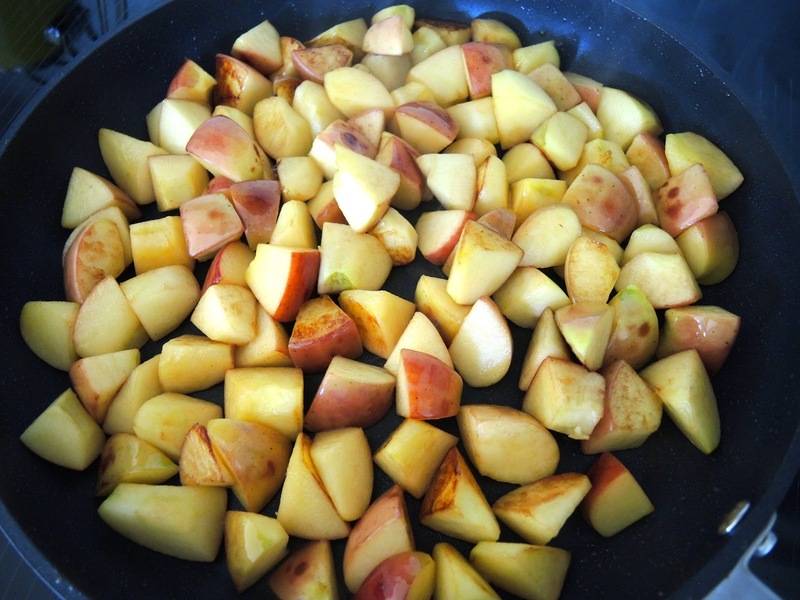 Sauté the apples over medium-high heat for a few minutes to caramelize the sugars and intensify the apple flavor. Adding a teaspoon of ground cinnamon to the sautéed apples adds another depth of flavor. 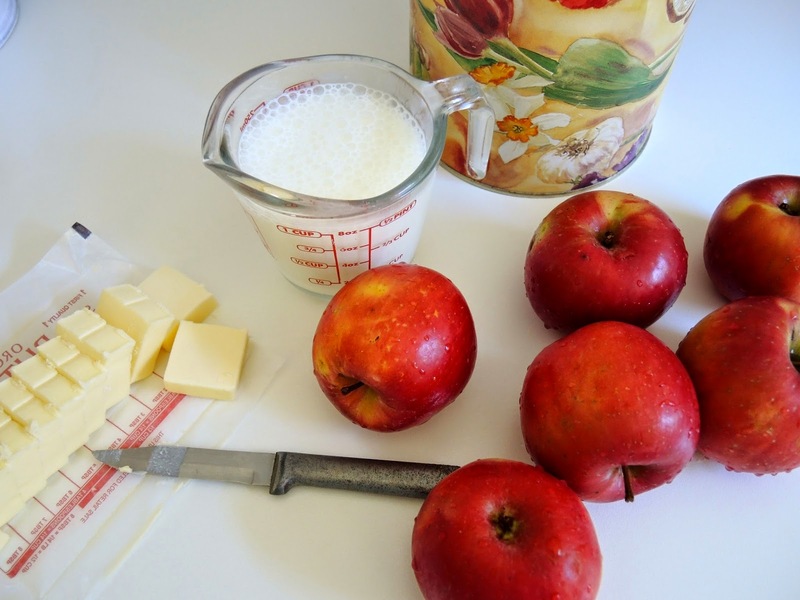 A large rubber spatula makes folding the apples into the cake batter much easier. Fold just until incorporated to keep the cake tender and delicate. For the apples - Cut apples in quarters, remove core. Cut each quarter in half and cut in thirds or bite-size pieces. Melt 2 tablespoons of butter in a skillet. Add apples and sauté over medium-high heat to lightly brown the apples, about 5 minutes. Sprinkle with 1 teaspoon of cinnamon sauté another 1-2 minutes until the cinnamon is fragrant. Remove from the heat and allow to cool. For the cake - Preheat oven to 350℉ (175℃). Stir together flour, baking powder, soda, salt, and 2 teaspoons cinnamon. 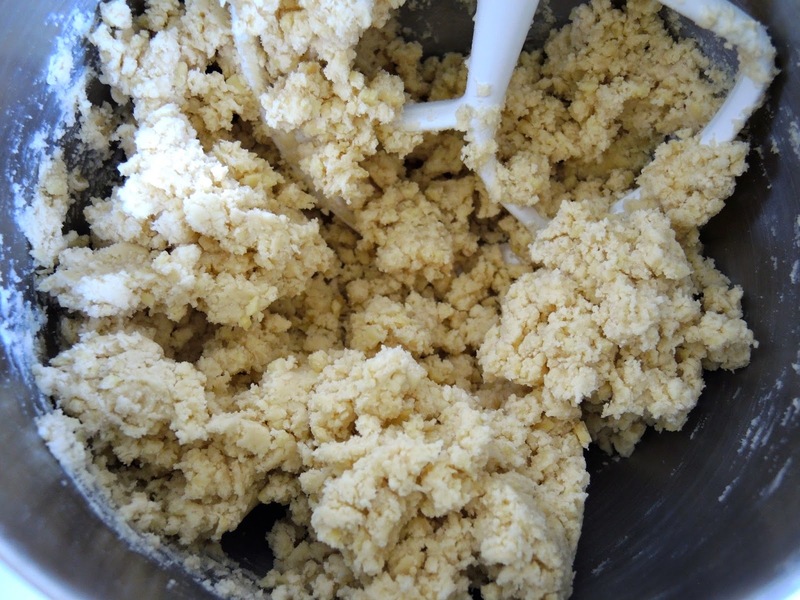 Put butter, brown sugar, and granulated sugar in the bowl of a standing mixer fitted with a paddle attachment. Beat until light about 2 minutes. Add the eggs and beat 4-5 minutes. Add vanilla extract. Alternate adding flour mixture and buttermilk in 2-3 additions. Mix just until combined. 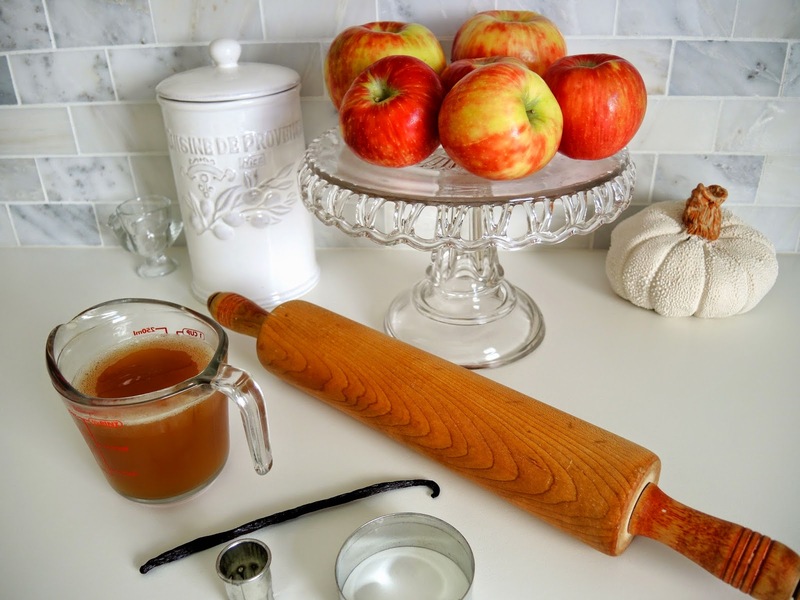 Fold in cooled apples using a large rubber spatula. Spread in prepared pan. For the topping - mix 1 tablespoon granulated sugar with 1/4 teaspoon cinnamon. Sprinkle over the cake. Bake until a tester comes out clean about 55-65 minutes.